For the uninitiated, 428 Shibuya Scramble is a visual novel. You play as five characters: Kano – a detective working a kidnapping case; Osawa – the father of the kidnapped person; Tama – a person who is selling questionably legal drinks so they can afford a necklace; Achi, a young man who eagerly wants to keep his environment clean. Lastly, there is Minorikawa – a freelance writer. As you can see, some stories easily overlap each other like Kano and Osawa. How you progress the case in Kano’s story will reach Osawa’s ears as he has other detectives stationed at his home. Others may just so happen to overlap by chance. Ultimately speaking, for the next 10 hours, the stories of these people are all connected. Despite the “connection” between everyone, the story isn’t told in a linear fashion. Each character has their own storyline to go through. What you do in one storyline will in turn affect the storyline of other characters. For instance, in the beginning of chapter two, Tama has a chance to give BURNING HAMMER to Sasayama, Kano’s partner. If you do, in Kano’s story while tracking down the suspect, Sasayama will give you the drink only to pass out giving you a Bad Ending. You do not have to worry about getting bad endings as they are in abundance and are CONSTANT. Again, the game has multiple timelines going on at the same time. In order for you to not getting too far ahead in one, the game has multiple roadblocks set up. One roadblock is the bad end. If you do not make the right choice in the correlating point in the other story or if you do not make it that far period, the game will automatically assume the worst outcome. Let’s go back to the example with Tama. As said previously, because I gave the drink to Sasayama who in turn gave it to Kano, Kano’s story got a bad end. If I never did Tama’s story, the game would give me that same bad ending. Don’t worry though, not all is lost with a bad ending. You can always go back and look through the timeline and choose a different path to take. The game will also give you a hint as to how to get past this ending. The second roadblock comes in the form of the game actively stopping you in the middle of the script so that way you do not get too far ahead and spoil other plot points of other storylines. As one can imagine, getting past this blockade is easy as you really just have to continue on with the story. The final thing stopping you on your path is ending the chapter. Each chapter is split into one hour blocks. This is put into place to be sure you are not getting too far ahead of everyone else’s story. Once they’ve all been completed, the next part of the story will begin. The story of 428 Shibuya Scramble is honestly one of the best I’ve read in quite some time. There are only a few games that go from completely serious writing to completely funny writing, and then back to being completely serious or vice versa flawlessly. This game is certainly one of them. 428 Shibuya Scramble has some of the strongest writing I’ve seen in gaming in a long time and it’s a shame something of this caliber has taken this long to reach the western market. Thankfully said market is opening up to visual novels more than ever allowing gems like these to be further appreciated. Something else that’s really appreciated in 428 Shibuya Scramble is the use of live action. It makes the game incredibly filmic. In fact, if someone showed me screenshots of a movie, and put the co-responding script next to it, this would be the result. I will say that it’s slightly disappointing that there is no voice acting done here to bring it up to the next level. However, what is brought to the table here is absolutely standout on every level. This also includes the music by Hideki Sakamoto and Aya Kamiki. Hideki’s contributions to Yakuza have been great and they’re amazing. As well as the inclusion of Aya’s music. 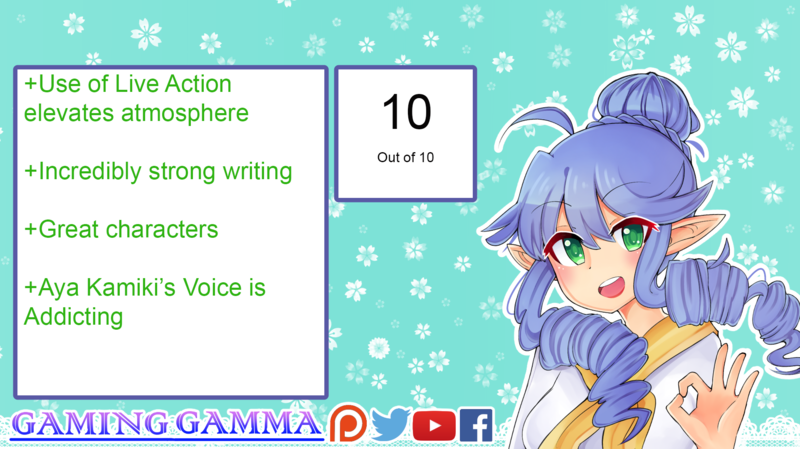 Granted, the inclusion of her music feels a lot more promotional of her own music since she is included in the game itself, but it’s still fun and energetic to listen to all the same. Posted on September 3, 2018, in Reviews. Bookmark the permalink. 1 Comment.